Phobophobia is the fear of fear while Thanatophobia is the fear of death. Fear has killed so many even before they died. Who wouldn't die anyway? So many run away from their fears and forget we only live to fight another day. The bravery of the young Thomas Sankara cannot be unrivalled. What a man who fears no death just to bring joy to the faces of his people. He learnt that he lived not for himself but others. Thomas Isidore Noel Sankara was a citizen of Burkina Faso who is pro-people, revolutionary, a Marxist, pan-Africanist as well as the president of Burkina Faso from 1983 to 1987. Due to the love his supporters had for him and seeing him as a charismatic figure as well as an icon of revolution, he was then referred to as “Africa’s Che Guevara”. While Sankara was under house arrest in 1983, there were a group of revolutionaries who seized power on behalf of Sankara in a coup that was well supported by the masses. 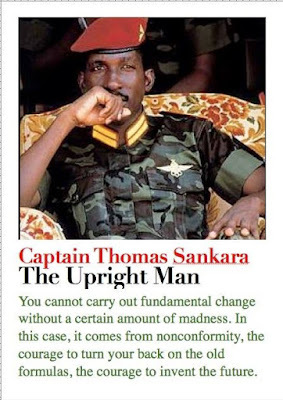 Then, Sankara was just 33 when he became the president of Burkina Faso which was also known as Upper Volta, with the aim of making the well-being of the poorest people in the country better through the elimination of corruption by limiting the dominance of the French colonial powerr. On ascending the throne, he immediately started an ambitious program to change the social, ecological and economical order of Africa; a reform to liberate Africa from mental slavery. In order to establish this order, he had to rename Upper Volta as given by the French colonial rulers to Burkina Faso (‘Land of Upright Man’) which is known popularly today. Sankara established foreign policies that focused on anti-imperialism; his government blocked foreign aid (to aid independence), forced reduction in the country’s debt; he made sure all land and mineral wealth become nationalized and limited the influence and power of World Bank and the International Monetary Fund on the country. Also, his domestic policies concentrated on reducing famine and pushing for self-sufficiency thereby making everybody returning to the farm, putting education first as well as creating a literacy awareness to get everyone educated; developing the public wealth of the country through the vaccination of 2.5 million children against yellow fever, meningitis and measles. Just to have this large influence and imposition of positive policies on the country, Sankara had to use the authoritarian strategy over the country. He made sure he banned all the unions and media stations he believed would be a hindrance to the success of his policies. In order to reduce the opposition voice, Sankara prosecuted the corrupt officials, counter revolutionaries as well as the lazy ones in the Popular Revolutionary Tribunals. Since Sankara is a follower of the Fidel Castro’s Cuban Revolution, he also set up a Cuban-style committee to defend revolution. Due to Sankara’s revolutionary programs for Pan-Africa independence as well as self-sufficiency, he became an icon to behold and follow for the African poorest. Among the citizens, Sankara was very popular. While we may try to be good to everyone, not everyone will love us. This was not different in Sankara’s case. Sankara’s policies and reforms were against the rich few, tribal leaders who he barred from collecting payment tributes and forced labour in Burkina Faso. He also had enemies from France and its ally, Ivory Coast. Unfortunately, on 15 October 1987, Sankara was killed by the troops led by Sankara’s best friend, Blasé Campaore who took over Sankara’s position a week later. A week before Sankara was assassinated; he had avowed that ‘While revolutionaries in form of individuals can be murdered, you cannot kill their ideas’. Thomas Sankara was born on 21 December 1949 in Yako, French Upper Volta to Joseph and Marguerite Sankara as the third out of ten children. Sankara had his primary education at Bobo-Dioulasso. He was studious, hardworking and took his schoolwork seriously which made him excel in mathematics and French. He attends church regularly and because of his eagerness to learn, the priests advised him to go to the seminary after his primary education. Though he agreed, he still took the final year exam at primary level and passed. Sankara decided to further his education and this particular decision was a turning point in his life because it took him out of his father’s house. 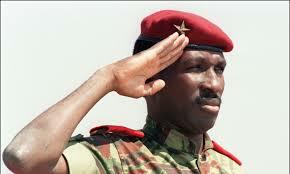 Sankara’s parents were Catholic and they wanted him to become a priest, however, he decided to join the military. Then, the military was popular in Burkina Faso because the president has just been ousted. The military was seen by the young intellectuals in the country as a potential institution to instill discipline and help punish the corrupt bureaucrats, help to deregulate the power of the ineffective traditional chiefs and also help modernize the country. Also, being accepted into the military comes with a scholarship and since Sankara could not afford his own education, he had to opt for the military, wrote the exam and passed. Sankara was admitted into the military academy of Kadiogo in Ouagadougou with the first intake of the academy in 1966 at the age of 17. When he was in the academy, he witnessed the first military coup led by Lieutenant-Colonel Sangoulé Lamizana on the 3rd of January 1966 in Upper Volta. The officers in training there were taught by the civilian professors in social sciences. Adam Toure, the lecturer who taught history and geography then in the military academy was known for his progressive ideas though he didn’t share them publicly and was also the academic director in the military school. One of the days, the academic director invited some of his brightest and more political students which included Sankara and engaged them in informal discussions on imperialism, socialism and communism, neocolonialism, the Soviet and Chinese revolutions, revolutions and liberation groups and movements in Africa and other related topics.